Every day is Christmas here! We've got a growing inventory of fabric, patterns, and fun classes. New this week: Purely Gates Mylar Embroidery Designs. VC has stitched a sample for us...come in and see how beautifully it turned out! We have more fun classes planned! Plus a monthly Sip 'n Sew and FREE Webinars! Due to the heavy rains last week, we extended our raffle for the Sew Pink machine and travel bag, a $650 value! We'll hold the drawing on Tuesday, November 3, at 5:30. Proceeds go to the Community Foundation at White-Wilson to help pay for mammograms for disadvantaged women. Come on in for some pink lemonade and cake and meet Leslie Moland, from the foundation, who will draw our winner! 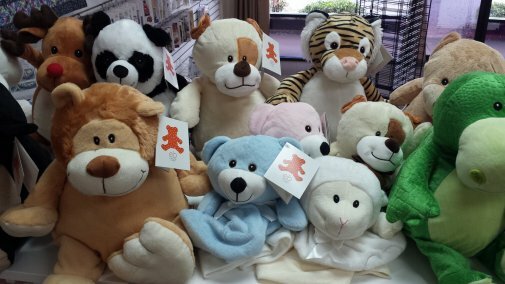 Stop by to see our Embroider Buddies! They are specially designed with removable pillows so they can be hooped and custom embroidered. These cuties will be difficult - maybe impossible - to reorder this year, so claim your favorite soon! Watch a VIDEO on how to Embroider a Buddy. Stitcher's Quest now has online shopping available for embroidery designs at Embroidery Design Studio. Click here to open your account. Quilting has never been easier! Learn how to make a table runner or place mats with X-Blocks. Choice of day or evening class. $22 plus supplies. Is wine on your giving list? Make it a memorable presentation with this creative Wine Tote! Amy will show you how easy it is to assemble this tote. This is also a great project for embellishment - pick up your supplies early so you can have your special touches ready by class day! $20-includes pattern and hardware. Free Webinar - Learn to capture the look of global handwork designs with the newest BERNINA Embroidery Collection - Folk Stitchery. These designs are perfect to use in creating garments, home decor items and more!